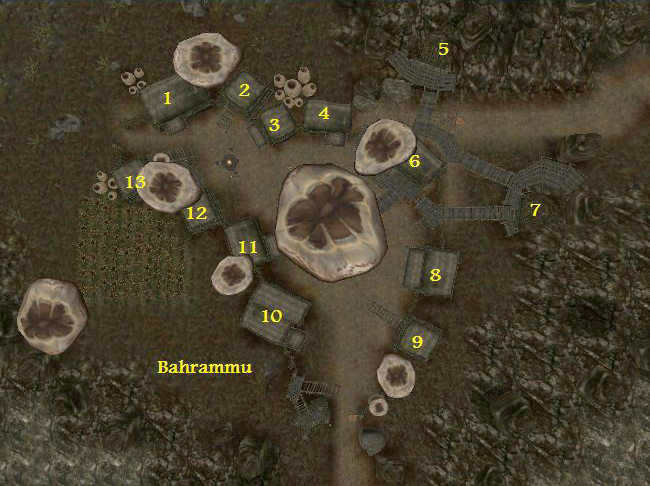 Bahrammu is a small shantytown on Balvvarden Isle, the northwesternmost inhabited island of the Telvanni Isles region, northwest of Bal Oyra. Its services are severely limited, and the town's activities offer virtually nothing out of the ordinary. "We are isolated here on the tip of Morrowind. We are far from the hustle of the main cities here," as the local townspeople say. 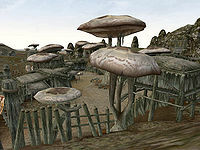 The entire town surrounds a central area, in the middle of which is a stereotypical Telvanni mushroom tree that acts as a central gathering place. Most of the huts and cave dwellings belong to farmers and common folk, but Elammu Andrani has set up a makeshift tradehouse in his shack, where he offers rudimentary weapons, ingredients and clothes, and an assortment of local alcohol. Marthen Redri has set up a rowboat service to Bal Oyra a short distance southwest from the town. To find him, follow the road south out of Bahrammu, and take the first right. Although his shack is nearby, he is standing on the tiny dock, ready to take you to the city. The only other place on the island is the Ashurnasaddus Grotto over the hills due north on the western edge of the beach. There is not much loot here. The Seradan Grotto is further northeast. Follow the road east out of town, swim north to the big island and follow the coast east to get there. The entrance is underwater. There is valuable and quest-related treasure here. A Rotten Shipwreck is across the water directly east of the east-leading path. Sadly, the pearl-bearing kollops along the way would probably offer more in the loot department than the wreck itself. 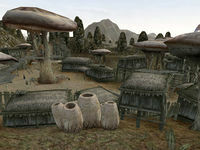 The village, and the whole of Balvvarden Isle are considered part of the Telvanni Isles region even though the Molagreahd region is much closer. The Widow and the Sea: A humble fisherman is lost, but was he taken by the sea? This page was last modified on 6 March 2019, at 07:28.